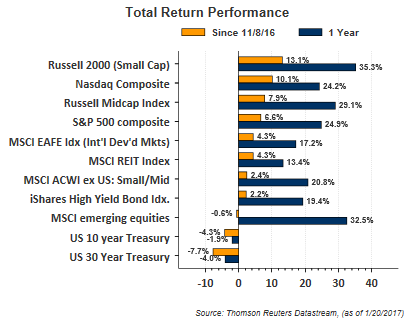 The return for many of the the equity indexes subsequent to the U.S. election has been stronger than many expected. However, most of the post election return was generated in the six weeks following the November 8 election with the equity market trading sideways since mid December. 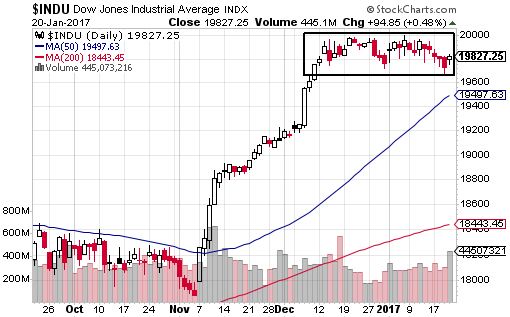 The post election spike higher has some investors waiting for a pullback in the market in order to invest cash that may be on the sidelines. 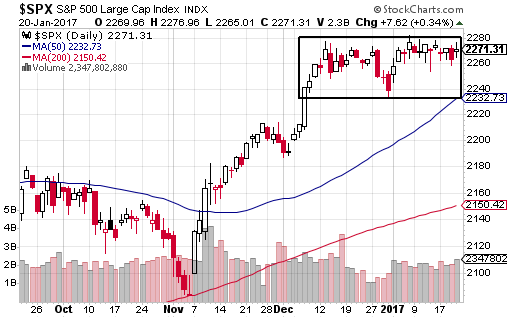 Below are a couple of index charts that show this sideways trading range. The one year return for the indices are showing sizable returns as well due to the low starting point from a year ago. As investors recall, the equity markets had a rough start to the year in 2016 culminating in a low reached in February. It is often noted that market corrections can occur either in price or over time time. At the moment, it appears this sideways market trend might be leading to a correction over time. One factor supportive of this is the sector rotation that has occurred since the election. 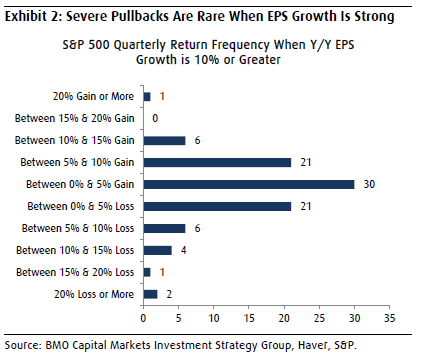 Knowing a significant pullback can occur at anytime, and frequently unpredictable, a factor providing upside support for the market is earnings. 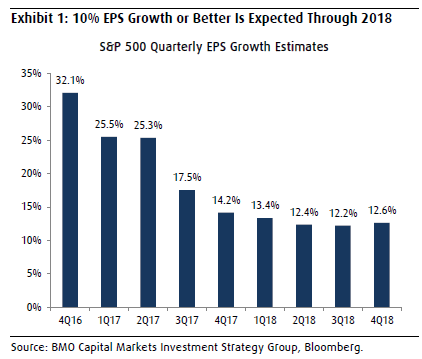 As the below chart shows, year over year earnings growth for the S&P 500 Index is projected to show a nice recovery from the earnings weakness experienced in 2015 and the first half of 2016. What is important about this earnings recovery is the odds of a sizable market correction is lessened during periods of strong earnings growth. The below chart shows a market return of minus 10% or lower occurs only 7% of the time when earnings growth is 10% of greater. Consequently, the odds that a significant pullback occurs and provides investors with an opportunity to increase their equity exposure at a lower price level is not in their favor.